A magnolia tree grows by the entrance to my small house. The earliest proof of spring is a cloud of fragrant pink at my doorstep and the intoxicating scent wafting indooors. Later on glossy green leaves appear but only after dropping petals carpet the ground beneath. Geologists have found fossil remains of Magnoliaceae dating to a 100 million years ago. 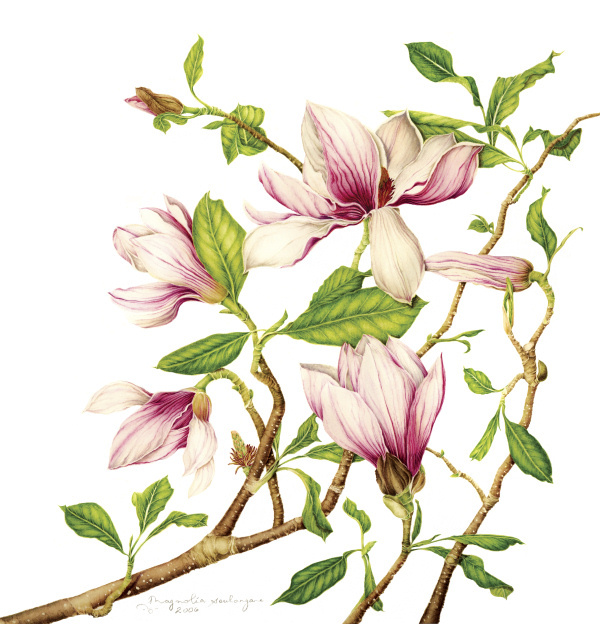 Magnolias existed alongside dinosaurs, and long before bees buzzed busily. The flowers were pollinated by beetles, and developed tough carpels (tarpels) for protection against insect damage. Look closely at the center of the flower and you will see a conical shape formed by numerous pistils spiralling in geometrical precision. This cone nests in a circlet of carmine-edged stamens—so many patterns, designs, colors for a curious eye to explore. 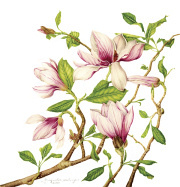 Magnolias were named to honor a French botanist, Pierre Magnol (1638-1715), who introduced the concept of plant families, a classification system based on morphology. This was indeed a radical insight in an age when the Book of Genesis was the sole explanation of all species and existence! Chevalier Ettiene Soulange-Bodin, a cavalry officer serving Napoleon, took up serious gardening after the French defeat at Waterloo. He bought Castle Fromont and set up an extensive conservatory where in 1820 he pollinated M. denudata with M. liliflora (Asian species) and when in 1827 the hybrid seedlings flowered they bore his name—Magnolia soulangeana. Plant hunters, missionaries, scientific and exploratory expeditions brought back samples and drawings from the Himalayas, China, Japan and from the Americas and Martinique to Europe for identification and systematic classification. Every spring when I enjoy the visual display of the Magnolia in bloom, and inhale its fragrance, I silently salute the many, many forgotten unsung heroes whose efforts have allowed this descendant of an ancient genus to grace my doorstep.